Voting is now closed, but you can still enter the drawing by leaving comments here and on our Facebook page. 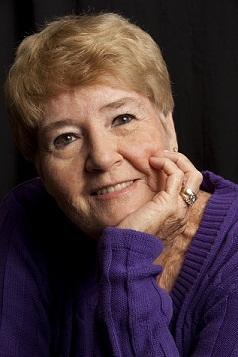 SQ Eads, aka Sunny, is the author of Angels in Cowboy Boots, excerpt A. Read a book? Write a story? Gag!! Give me a root canal instead. At twenty-one I finally read my first book -- just for fun. A monster was born. I read sitting, standing, riding in the car, rocking my babies and cooking. My husband begged that I write instead of read. That challenge changed to a passion and a love of story-telling. Favorites: Nothing beats grandkids, reading, writing and music. Dislikes: Total frustration is a jigsaw puzzle whose pieces don't interlock. Dreams: I dream of seeing my books in every bookstore and for readers to anxiously await the next SQ Eads release. 1. Sunny, how long have you been writing? SQ Eads is my pen name, I've been writing for over twenty years. 2. What do you love about writing in general, and about this book in particular? I love writing because, unlike life, I can guarantee a happy ending. God seems to plant an idea in my mind, then He lets me run with it and develop the story. In the end, Jesus is the answer to all my characters' problems. 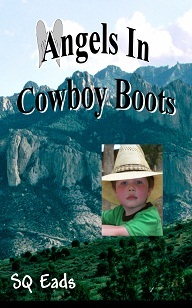 In Angels In Cowboy Boots, Matt, the four-year-old boy, holds a special place in my heart; he's a blend of my five grandsons. Sarah is far from Dave's idea of a perfect mate, but God repairs the broken and makes it ideal. 3. How did you arrive at this particular back cover blurb? Was it you or your publisher or a group effort? I created the blurb. I wanted the reader to see how all things are possible with God. In Angels In Cowboy Boots, God takes a broken life and a misguided one, intertwines the two, and creates a deeply loving couple to parent an orphaned boy. 4. What do you do first when you’re browsing in a book store? Back cover, front, cover, inside, first few pages? What usually entices you to buy a book by an author new to you? When browsing in a book store, my first step is to look at the title then read the back blurb. My decision to purchase comes from that information. It hooks me or it doesn't. 5. Can you share your best marketing tip? Get your name out there. Get on as many websites as possible. Oh Sunny, I have to agree--with writing we can make sure there's a happy ending to our stories. I believe in those happy endings too. We know that we have a great big happy ending coming with God when we all get to Heaven, but in life it's hard to see that far off. Stories like yours give us hope to keep on persevering. I look forward to reading your work. I know the Lord's fingerprints are all over it. The little boy on your cover is soooo adorable. What's the story with him? Sunny, you said you like music. Do you play an instrument, sing, or just enjoy listening? Sunny, this book blessed me in so many ways. I have also read another of your books this week, and I must say that I'm anxious to read the other books. And then what will I do? You must write fast, please, so that I will have a new book to read. Never have I enjoyed fiction this much. God Bless You! What sweet, encouraging comments, Elizabeth! Thanks for stopping by.